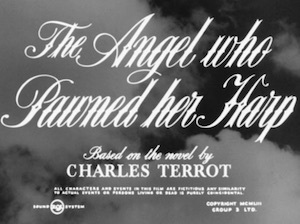 An angel (Diane Cilento) is given the assignment of going to an area in London to help improve the lives of several residents, pawnbroker Joshua Webb (Felix Aylmer), his employee, Len, (Philip Guard) and Jenny Lane (Sheila Sweet) who Len has a crush on. Realizing she'll need money, the angel pawns her harp (a large pedestal model) with Joshua for twenty pounds, against his better judgement. She takes her money to the dog races and uses her angelic powers to dramatically increase her funds. The lonely pawnbroker Joshua has a priceless collection of antique music boxes, but is worried that his heirs will get rid of them when he dies. Len lives with his mother (Genitha Halsey), who is dominated over by a bullying and opinionated friend, Mrs. Trap (Phyllis Morris). When he brings Jenny home to meet his mother, Mrs. Trap belittles both of them while his mother stands helplessly by. The angel tries to give Joshua and Len the confidence they need to overcome their problems. At the angel's urging, Joshua presents a program about his music box collection for a group of neighborhood children. They respond enthusiastically, and form a music box appreciation group. Len gains the courage to order Mrs. Trap to leave his home, then he proposes marriage to Jenny. The angel reclaims her harp and, her mission successfully completed, returns to her heavenly base. 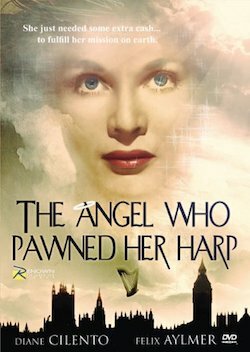 The Angel Who Pawned Her Harp was suggested for this site by Karine Philippot.